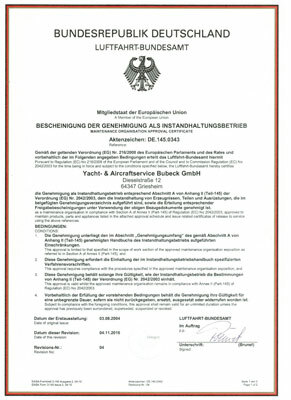 Yacht & Aicraftservice Bubeck was founded in 1998. Starting with the interior cleaning of small private aircraft and boats, we have come a long way. From day one we put the customer first and did everything to understand his needs. As customer satisfaction breeds success, we could expand our service portfolio develop into new markets. Thanks to our EASA part 145 certificate we can offer a broad spectrum of services for preserving the value of your aircraft. Centrally based in Frankfurt and Basel our mobile teams will be everywhere you need us within a short time. Discover our world of aircraft care.